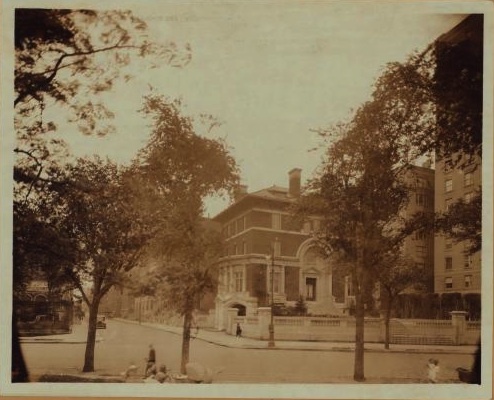 When megabucks lawyer Isaac L. Rice built his four-story Georgian-Beaux Arts residence (below, in a NYPL photo) there in 1903, Riverside Drive was supposed to eclipse Fifth Avenue as the city’s most luxurious place to live. 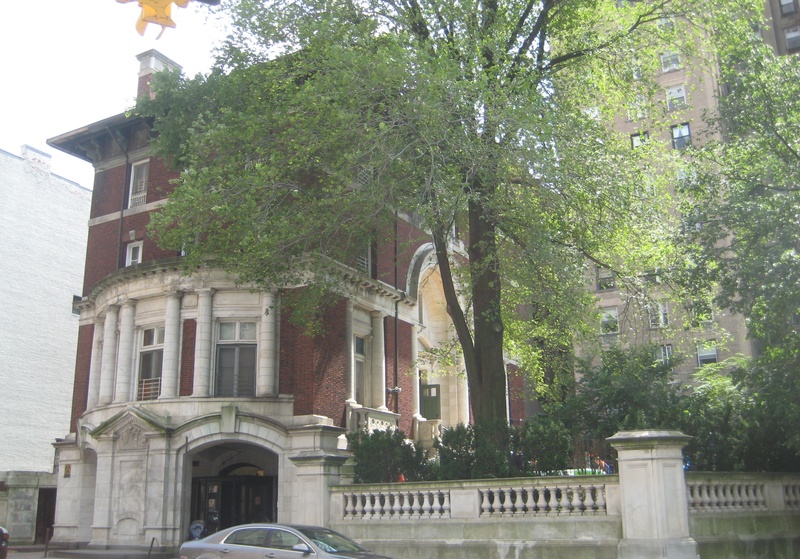 That didn’t quite happen, though Riverside Drive certainly had its share of opulent homes—especially the 30 or so free-standing mansions that used to line the street. Today, only two remain. One is the Rice mansion on 89th Street, across from the Soldiers and Sailors monument overlooking the Hudson River. Called Villa Julia after Rice’s wife, the red brick, white marble mansion was spectacular in its day. The entrance, on 89th Street, featured a two-story stone arch, and the grounds had a reflecting pool and colannaded garden. Inside, Rice built himself a chess room—he was an avid fan of the game. The Rices didn’t live there very long. They decamped in 1907 for the new Ansonia apartment building on 74th Street. In 1954, the mansion was bought by a Yeshiva, which still owns it today. It’s a bit shabby and not as impeccably maintained as it could be, but it’s still a lovely reminder of how the superrich lived in New York more than 100 years ago. This entry was posted on July 9, 2012 at 5:38 am and is filed under Schools, Upper West Side/Morningside Hts. You can follow any responses to this entry through the RSS 2.0 feed. You can leave a response, or trackback from your own site. I have a direct view of the Rice mansion from my apartment. I love that it is still there, but hate the way the Yeshiva maintains it. The rain gutters on the alley side are made from plywood and there is a very noisy family of raccoons that live in one of the old kitchen chimneys (they climb straight up about 12-feet to a huge hole in the brickwork). The ornamentation covered in moss and pigeon poop and the brick is in need of pointing. A few years ago, a neighboring building filed a suit against the school to seed their lawn as it was a dustbowl (they won) which, thankfully, cut down on the huge amount of dust blowing in the neighboring building’s windows. I’ve never been inside, but the interiors got an overhaul a few years ago. I can’t tell from my vantage point if any of the plaster ceiling details survived or not. Hopefully, they were just paneled-over instead of lost for good. On the plus side, the friezes below the roofline survive, and there is an amazing HUGE ornate iron bracket which attaches the kitchen chimney to the house. With some TLC, this could be a stunning place again. 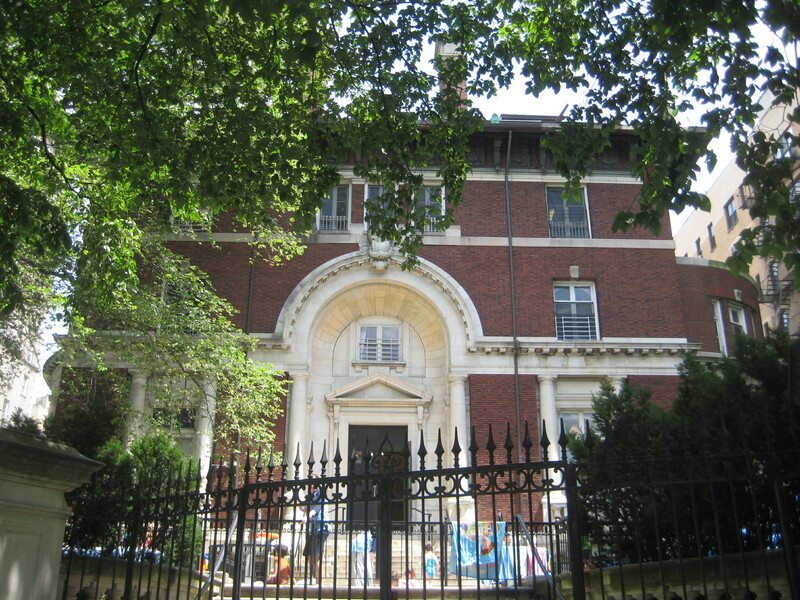 The fact that a Yeshiva bought, and not a private owner, it is probably why it survived being torn down. I get that the Yeshiva is a non-profit and always strapped for cash, but a little more respect for the building might help them with their maintenance bills down the road. The state of this house is a disgrace. It is a pity that it hasn’t a more sensitive and caring occupant. Every time I pass it, I wish the Yeshiva would be evicted and some caring family or institution worthy of it would replace them. I know of the other single family home located at 351 Riverside Drive near 107th street. Built by William Tuthill, it is in impecable condition & actually is currently for sale so you can see some wonderful pictures of the interior on streeteasy. I didn’t know of the Rice mansion. Will walk over to take a peek. Every time I hear “one of the few remaining” I feel sick. I love many of the tall buildings in Manhattan but to have seen all the amazing mansions would have been incredible. I wish there was some way to recreate them. It’s too bad all the people with the money to do it seem more intrested in minimalist apartments. Hell, with their money, they could have both. I just wish rich people gave a crap about saving glorious old buildings. There is one near the battery tunnel that looks like a disaster but If I were a millionaire I’d buy it and restore it to new. Too bad they can’t rip out the tunnel entrance. It’s really a blight on the neighborhood. Car culture really did a number on many once beautiful areas.It’s too bad the LPC came 50 years too late. of the building was not being used due to it being too expensive to update. cobble stones and a circular drive that was used by the carriages to drop its passengers off. It was also one of the most powerfully windy places on the block in the height of the winter. Peering out from the windows one could almost imagine the women and men of another era strolling along riverside drive to the clopping of horse and carriages as they made their way along the cobble stone streets. I went to kindergarten in the school in this building & learned to walk on stairs there. I recall in the 70s, the site was going to become a high-rise, but got landmarked. Still, surprised that no one has made a successful bid on such a unique Manhattan property.